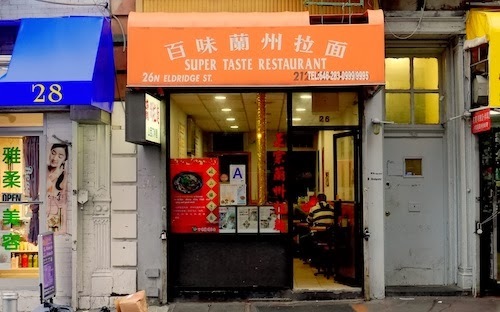 The menu at Super Taste is pretty typical of a hand-pulled noodles joint in Chinatown, as is the food. 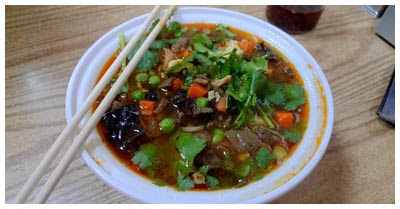 Good, warming soups and quality homemade noodles. But one thing sets Super Taste apart from its competition, the amazing Mount Qi noodles ($6, below), a bright red, almost glowing, bowl of hand-pulled noodles with some really incredible spicing. The sign on the wall reads a long list of awkwardly stated qualities, but they are all true. It's like magic. While you're at it, a big plate of steamed dumplings ($3, below) is a good deal. The small place will bring out each dish at wildly different times, even when everyone orders the same thing, but somehow it is charming. I still dream of Mount Qi. You should too.